Have you scheduled your Annual Wellness Exam? This important yearly examination with your primary care provider includes a check of your weight, cholesterol, glucose and blood pressure, a review of your medical history, immunizations and medications, and discussion about appropriate screenings such as mammogram and colonoscopy. Your provider will help create your personalized prevention plan. 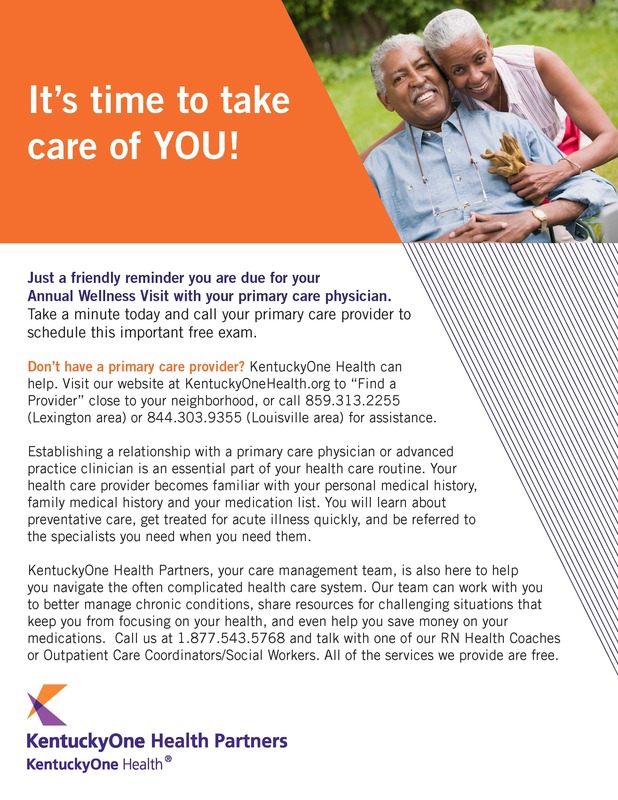 Call your primary care provider today to get your annual wellness exam scheduled. Don’t have a primary care provider? CHI Saint Joseph Health Partners can help. Visit our website to “Find a Provider” close to your neighborhood, or call 859.313.2255 (Lexington area) or 844.303.9355 (Louisville area) for assistance. At CHI Saint Joseph Health Partners, we want you to be active in improving your own health. Our team is available to assist you achieving your health goals by connecting you with valuable resources. We work directly with patients and their primary care providers and become involved in health improvement activities. For example, we may help you find resources to better manage chronic conditions, work to help you reduce the amount you pay for services or by selecting the most cost effective medications. Our team is experienced in helping to set goals, overcome barriers to a healthier lifestyle and provide support in managing chronic conditions.